Human Body Parts Names in English! When you are sick, or just need to ask someone a question related to the human body, it is important that you are able to explain what the matter is. Whether you’re talking to a doctor, pharmacist or friend, by email, telephone or any other means. 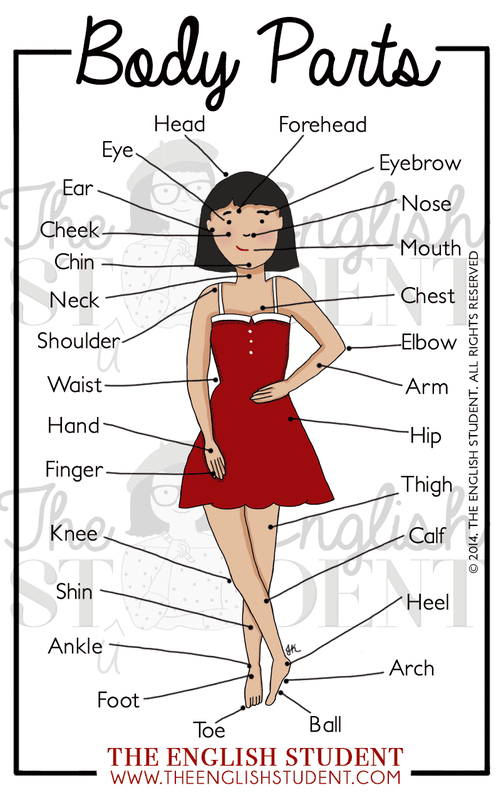 Thus, it is vital that you know the terms for different body parts and how to use them in conversation. I have broken down the different body parts into sections, and given example sentences showing how to use them in conversation. HAIR – The fine threadlike strands growing from skin, especially on a person’s head. Your brother pulled my hair really hard, and now my head hurts! HEAD – The uppermost part of the human body, containing the brain, mouth and sense organs. I accidentally walked into the door and hit my head really hard! It feels sore now. FOREHEAD – The part of the face above the eyebrows. I have a lot of spots on my forehead, because I eat too many sugary sweets. EYEBROW – The strip of hair growing above a person’s eye socket. He raised his eyebrow in a questioning gesture. EYELASH – The short curved hairs growing on the edge of a person’s eyelid, serving to protect the eyes from dust particles. My eyelashes are falling out from using too much mascara! EYELID – The upper and lower folds of skin that cover the eye when closed. EYE – Globular organs in the head through which we see; the visible part typically almond-shaped on animals with eyelids. CHEEK – Either side of the face, below the eye. Ouch! I just bit the inside of my cheek by chewing my food too fast. JAW – Upper and lower bony structures that move when talking or eating, forming the framework of the mouth and containing the teeth. I have a stiff jaw because someone punched my face yesterday. NOSE – The part projecting above the mouth on the face of a person, containing the nostrils and used for breathing and smelling. Last week, two burglars stole my wallet and phone, then punched me in my face and broke my nose, because I tried to stop them! NOSTRIL – The two openings of the nasal passage that admit air into your lungs and allow you to smell. There is blood coming out of my nostrils and I’m not sure why! LIPS – The two fleshy parts that form the upper and lower edges of the opening of the mouth. My lips are very dry because I feel thirsty. Can I have some water please? TOOTH (singular) / TEETH (plural) – Hard enamel-coated structures in the jaws of most vertebrates, used for biting and chewing. I cracked my tooth on a hard nut! I need to visit a dentist. TONGUE – The fleshy muscular organ in the mouth of a mammal, used for tasting, licking, swallowing and (in humans) articulating speech. I bit down on my tongue while eating French fries, and now it is bleeding! MOUTH – The opening in the lower part of the human face, surrounded by the lips, through which food is taken, and from which speech and other sounds are emitted. I ate some very spicy food and now my mouth is burning! CHIN – The protruding part of the face below the mouth, formed by the apex of the lower jaw. I have a big mosquito bite on my chin. THROAT – The passage that leads from the back of the mouth of a person or animal to the stomach, or to the lungs. I have a sore throat and cannot swallow food properly. FACE – The front part of a person’s head, from the forehead to the chin. You should wash your face thoroughly with soap every day. NECK – The part of a person’s body connecting the head to the rest of the body. SHOULDER – The upper joint of the human arm and the part of the body between this and the neck. I think I broke my shoulder while exercising. It hurts to move my arm! FINGERNAIL – The flattish hard part on the upper surface of the tip of each finger. I got my finger stuck in the door and my fingernail broke. FINGER – Each of the four slender jointed parts attached to either hand. I accidentally cut my finger while chopping vegetables. THUMB – The short, thick first digit of the human hand, set lower and apart from the other four. He pricked my thumb with a needle. PALM – The inner surface of the hand between the wrist and fingers. He held the spider in the palm of his hand. HAND – The end part of a person’s arm beyond the wrist, including the palm, fingers and thumb. He held my hand tightly all the way to the station. WRIST – The joint connecting the hand with the forearm. I broke my wrist playing badminton last week. FOREARM – The part of a person’s arm extending from the elbow to the wrist. My forearms feel sore after rock climbing today! ELBOW – The joint between the forearm and the upper arm. He rammed his elbow into my ribs! UPPER ARM – The part of the arm between the elbow and shoulders. My upper arms are sore after that tug-of-war game! ARM – Each of the two upper limbs of the human body from the shoulder to the hand. She held her newborn baby in her arms for the first time. CHEST – The front surface of a person’s body between the neck and the abdomen. My chest hurts a lot every time I cough. STOMACH – The internal organ in which most of the food digestion occurs. I feel sick in my stomach; I think I ate too much cake! BACK – The rear surface of the human body from the shoulders to the hips. If you don’t do sit-ups properly, you could injure your back. WAIST – The part of the human body below the chest and above the hips. That dress really shows off your lovely waist. ABDOMEN – The part of the body containing the digestive organs. In humans, it is bounded by the diaphragm and the pelvis. She felt a sharp pain in her abdomen every time she moved. HIPS – A projection of the pelvis and upper thigh bone on each side of the human body. Women generally have wider hips than men. BOTTOM – The buttocks; two round fleshy parts that form the rear area of a human trunk. He slipped on the icy road and fell flat on his bottom. LEG – Each of the limbs on which a person or animal walks and stands. I broke my leg in a motorbike accident. THIGH – The part of the human leg between the hip and the knee. My thighs are very sore after running that marathon! KNEE – The joint between the thigh and the lower leg in humans. I damaged my left knee while playing football last week. CALF – The fleshy part at the back of a person’s leg below the knee. I have very strong calf muscles because I run a lot. SHIN – The front of the leg below the knee. She kicked me on my shin with her pointy high heeled shoes! ANKLE – The joint connecting the foot with the leg. I twisted my ankle yesterday; it is still really swollen. HEEL – The back part of the foot below the ankle. I accidentally stepped on some broken glass, and I think there is still a tiny piece stuck in my heel. FOOT (Singular) / FEET (Plural) – The lower extremity of the leg, below the ankle, on which a person stands or walks. My feet feel squashed; these shoes are too tight for me. TOE – Any of the five digits at the end of a human foot. He cut his big toe on a sharp stone. TOENAIL – The nail at the tip of each toe. I need to cut my toenails; they are so long now! BLOOD – The red liquid that circulates in the arteries and veins of humans, carrying oxygen to and carbon dioxide from the tissues of the body. I donate blood every year to help other people. BONE – Any of the pieces of hard, whitish tissue making up the human skeleton. I am very lucky that I survived the accident, and didn’t break any bones! MUSCLE – A band or bundle of fibrous tissue that has the ability to contract, producing movement in or maintaining the position of parts of the body. I think I might have pulled a muscle in my leg from running too much. SKIN – The thin layer of tissue forming the natural outer covering of the body of a person. My skin is sunburnt because I fell asleep on the beach yesterday! LEFT – on, toward or relating to the side of a human body that is to the west when the person is facing north. I can’t see clearly in my left eye. RIGHT – on, toward or relating to the side of a human body that is to the east when the person is facing north. My right-hand thumb is swollen because a bee stung me! JOINT – A structure in the body at which two parts of the skeleton are fitted together. My joints have been aching since I ran the London Marathon.